Heat oven to 350°F. In medium bowl, mix all crust ingredients until well blended. Press in bottom and up side of 9-inch glass pie plate. Bake 8 to 10 minutes or until golden brown; cool. In large bowl, mix ice cream, lemonade concentrate, whipped topping and a few drops food color. Spoon and spread ice-cream mixture into cooled crust. Freeze until firm, about 4 hours. Let stand at room temperature a few minutes before cutting. Garnish with lemon peel. In a hurry? Pick up a ready-to-use graham cracker pie crust, and you can whip up this pie in 10 minutes! Just freeze, and enjoy! 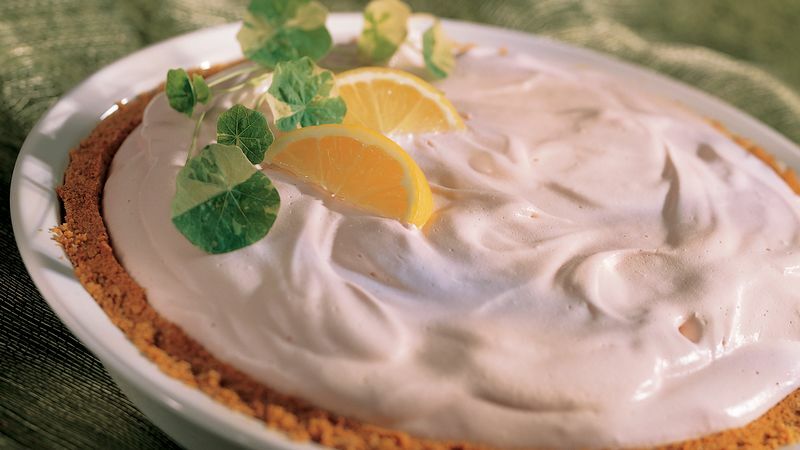 For yellow lemonade pie, replace pink lemonade concentrate with regular lemonade concentrate, and add a few drops of yellow food color.